The right nutrition and supplementation can help you thrive, rather, than survive during leg day. This is what you need to know about how to fuel up, recover, and even cheat right! Leg day isn’t for the faint of heart. For 60-90 minutes, you repeatedly contract the largest muscles in your body until you reach the point that your quads are yelling, hammies screaming, and you can barely walk out of the gym. No wonder so many skip it. Even with perfect preparation, a proper leg workout is brutal. But if you’re not well-fueled, then not only will the workout feel far worse, but you'll get less muscle and strength to show for it. Do I have your attention now? Carefully crafting your pre-, intra-, and post-workout nutrition and supplementation is essential for lower-body training, even if you don't take those things nearly so seriously during the rest of your training week. If you want to finally generate some growth in your wheels, follow the exact blueprint outlined here! You may be somebody whose life and obligations make building the day around a workout hard. I get it! But if you want to rock serious legs, you'll need to put in some serious leg days. And serious leg days demand pre-workout nutrition planning. Proper leg day pre-workout nutrition and supplementation should not only ready the body but also ready the mind. If you’re don’t have an unmatchable level of motivation, focus, and fuel, the chances of you surviving your workout feeling strong will be as slim as your thighs. Timing: Friends don't let friends train legs before breakfast. Seriously! I don't recommend you train legs first thing in the morning if you’re looking to maximize growth or plan on pushing serious weights. Doing so doesn’t give you ample time to consume and digest the copious number of calories you’ll need to adequately fuel yourself. Instead, I recommend moving your leg day workout to the afternoon or even the evening. Even if it happens during lunch, that's better than morning—provided you eat a solid breakfast. Ideally, your pre-workout meal should be the second or even third meal of the day. It should also be the largest meal of your day, or second-biggest to your post-workout meal (more on that below). I'm very generous in what I consider "pre-workout," though. Your leg day pre-workout meal should ideally be eaten roughly three hours prior to your workout. This gives you plenty of time to digest the colossal portions I recommend, so that you do not feel bloated or heavy as you begin your warm-up. Portions: To ensure you’re ready to tackle leg-day quad-on, I recommend that you place 30-40 percent of your total daily carbohydrate intake at this meal. I also recommend that you consume 25-35 grams of high-quality protein, and 1-2 servings of vegetables. Furthermore, I recommend that you consider increasing your total daily calorie intake by 15-30 percent compared to typical levels on this day to accommodate the high-volume battle you’re about to face. This will ultimately translate to a bigger pre-workout meal. Nutrient Selection: Given the advanced timeframe, it's important that you select high-fiber carbohydrates for your pre-workout fuel. Choosing high-fiber carbohydrates will ensure that your blood glucose levels and energy remain relatively steady between the time you eat and your warm-up. Choosing a large portion of low-fiber carbohydrates will lead to a crash in blood glucose and energy levels before you begin your warm-up. Not ideal if you need to thrive during a 60-90-minute workout. Your protein should come from a low-fat, complete protein, such as any animal protein source, soy, or quinoa. 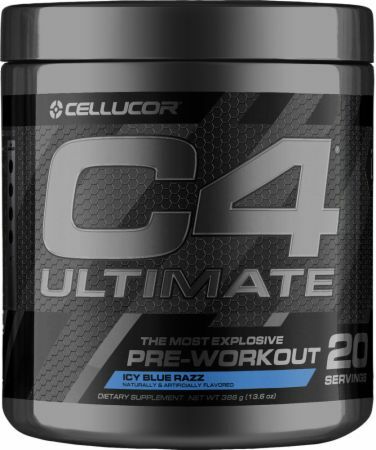 This will help to “turn on” muscle growth and repair at the cellular level one more time before you enter a catabolic (muscle breakdown) period. Don't slurp these down during your warm-up sets. Your pre-workout supplement cocktail should be consumed 20-30 minutes before your warm-up. This allows the supplements to enter your bloodstream and to begin exerting their benefits by the time you start your first working set. Caffeine: Caffeine is a stimulant that will enable you to push harder, complete more repetitions, and increase your focus. Even if you skip it during the rest of the week, consider it for a hard leg workout. Since caffeine tolerance is highly individualized, I'm not going to give a specific recommendation. Just be mindful of your daily caffeine intake and the time of your workout when dosing your pre-workout cocktail. Not being able to sleep after a leg workout isn't going to help you recover! Beta-alanine: Technically a non-essential beta-amino acid, beta-alanine has quickly become anything but non-essential in the worlds of performance nutrition and bodybuilding. Also known by its trademarked name CarnoSyn, it is probably the most consistently effective performance-enhancing supplement to hit the sports nutrition market since creatine. Nootropics: Given the demanding nature of leg day, you may consider investing in a pre-workout (or individual nutrients) that provide nutrients than enhance mental focus and drive. These substances are known as nootropics, and are in more pre-workouts than ever. Example nutrients include L-theanine, Theacrine, Acetyl L-Carnitine (ALCAR), and Alpha-GPC. Citrulline Malate: Citrulline is an amino acid that has been shown to delay fatigue. It’s also a by-product of the body's conversion of the amino acid arginine into nitric oxide. And when excess citrulline builds up, there’s ultimately an increase in nitric oxide production, which enhances blood flow and nutrient delivery to your working muscles. Dose: Take 6-8 grams in your pre-workout cocktail. Creatine: It’s not necessary to take creatine with your pre-workout concoction, but it’s worth noting this is an easy time to remember to do it. If you want to maximize growth, creatine needs to be a staple in your supplement regimen. It’s perhaps the most extensively studied sports nutrition supplement and has been shown time and time again to enhance muscle strength and muscle growth.Dose: 3-5 grams per day, pending on your body size. You'll be expending significantly more energy during your leg day workout compared to any other. So similar to caffeine and meal-planning, this workout is worth a little extra attention when it comes to intra-workout nutrition. To ensure that you’re able to sustain the mental fortitude and energy necessary to complete such a workout, I recommend an intra-workout cocktail to help sustain energy levels, maintain optimal hydration, enhance nutrient delivery to your muscles, and to minimize muscle breakdown. A blend of protein or aminos, fluids, and electrolytes is essential to ensure that you’ll be equipped to survive this epic volume blast. To take it to the next level, consider adding some carbs. These don't have to be powdered, either. Just mix your favorite sports drink with whey protein or an amino acid supplement to reap benefits you can feel almost immediately. The purpose of the post-workout meal is fairly straightforward: you need to choose enough of the right foods in a timely manner to replenish your glycogen (carbohydrate) stores, rebuild and repair damage muscle tissue, and rehydrate yourself so that you can be primed to hit the gym again tomorrow, and your next leg workout a few days later. Timing: Your post-workout meal should be consumed within 60 minutes of finishing your last set. The sooner you consumer your post-workout meal, the greater the likelihood that the carbohydrates you consume head straight to your aching muscles. Similarly, the sooner you consume your meal, the quicker you help to flip the switch from a catabolic (muscle breakdown) to an anabolic (muscle growth) environment. Portions: Your post-workout meal should be as big, if not bigger, than your pre-workout meal. It should contain 30-40 percent of your daily carbohydrate intake and an adequate amount of protein to maximize muscle growth and repair. The time-honored dose is 25-35 grams of protein. However, recent research published in Physiological Reports suggests that the amount of protein necessary to maximize growth and repair may be elevated after a workout, which suggests up to 40 grams may be optimal in this instance. Type of Food: Your carbohydrates should be split between a 50-50 mixture of high-fiber, slow-digesting and low-fiber, fast-digesting carbohydrates. This combination will promote rapid glycogen replenishment, but also provide you enough fiber so that you’re not hungry an hour after eating. Your protein selection should come from a lean protein source and ultimately contain some form of both fast and slow-digesting proteins. For instance, a whey and casein protein blend work well, but so will a shake and then a chicken breast. This combination will provide an immediate positive impact on the muscle growth and repair processes but also help to create a sustained anabolic atmosphere for the hours to come. Should I Cheat On Leg Day? Having a cheat meal or scheduling a carbohydrate re-feed day on leg day are two common strategies used by fitness enthusiasts abound. And for good reason! No other workout in your split likely compares in terms of volume and intensity. For this reason, it’s likely you’re burning significantly more calories on leg-day compared to any other day of the week. It's also likely to be the workout that produces the greatest release of anabolic hormones in your workout, so why not give your muscles fuel to grow—and yourself a reward for your hard work? If there were one perfect day to cheat or enjoy a refeed day, this is it. Here’s what you need to know if you want to take either one of these approaches. Spread it out: First, don’t just have a single food you don’t often let yourself enjoy—say, a single little post-workout cheeseburger. Make a concerted effort to take in more calories than usual across the day. You'll need them to both fuel your workout and enhance recovery afterward. Bolster both your pre-workout and post-workout meals with these added calories to maximize their utility. Randomly having a cheat meal much earlier or later in the day is not going to have the same impact on your physique, recovery, or performance. Have a shake first: I recommend finishing your workout with a whey protein shake to quickly flip the switch to an anabolic atmosphere, before the large volume of food you consume significantly slows down digestion. Then, an hour or so later, proceed to chow down on a large amount of food. Don't count: I do not recommend that you track calories or portions here. Eat until you're full! However, I do recommend you stay away from your local buffet if this will be a weekly or twice-weekly plan. Carb up: Furthermore, I encourage you to prioritize carbohydrates during this cheat meal or refeed as your body is highly receptive to them immediately after a workout. A high-fat meal will slow down digestion and potentially limit carbohydrate replenishment. Got those rules down? Now go earn that cheat meal the hard way: with one of the three brutal leg workouts in this feature! Macnaughton, L. S., Wardle, S. L., Witard, O. C., McGlory, C., Hamilton, D. L., Jeromson, S., ... & Tipton, K. D. (2016). . Physiological reports, 4(15), e12893.